Depending on your opponent, sometimes the best play is the aggressive shot. And hopefully you�re in a groove and feeling confident. That was the situation in which Troy Frank found himself while playing Efren Reyes in the final of the 1999 Derby City Classic�s 9-ball division. This month�s entry into our compendium of incredible shots actually could be considered a two-fer. Frank�s first eye-popping shot in the last rack required some planning, but the second was a surprise to everyone. 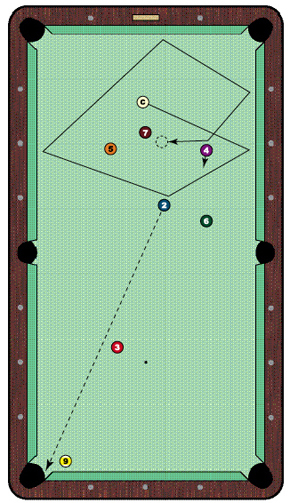 Frank streaked through the Derby 9-ball brackets on the wings of devastating play. The 28-year-old house pro and road player from just outside Canton, Ohio, wasn�t intimidated by his world-champion foe in the final. Leading 6-4 in the race-to-7 match, Frank had the option of pushing out or playing safe on the layout diagrammed here � both less-than-desirable options against the kicking wizard Reyes. So, Frank lined up the kick on the 2 ball � to the consternation of the Accu-Stats commentators calling the match � and calmly nailed it in the corner. The cue ball traveled three rails and nudged the 4 for position on the 3. Frank planned to pocket the ball in the bottom-left corner, figuring it could pass the nearby 9 ball. Indeed, the 3 hit the 9 more fully than expected, knocking the yellow stripe uptable and into the left corner for the title.